Happy New Year. Now’s the time for planning new challenges, and we’re no different: we’ve just launched a new survey to discover what you want in adventure content. By filling it in, you could win £100 and you’ll definitely be helping shape the future of BMC TV. Fill in the survey here. 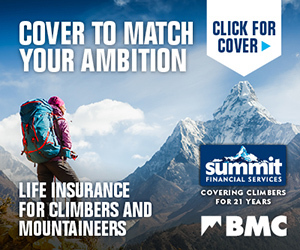 And if you’re planning your own winter adventure, don’t forget that there’s 15% off our European AMT Alpine and Ski insurance. See you on the slopes. Are you well organised with a background in governance and compliance? The BMC is seeking an experienced individual to champion and lead on this vital area of work across the organisation, and to ensure our compliance with a range of internal and external regulations and legislation. Nathan Phillips, reigning British Bouldering Champion and member of the GB Climbing Team, has just climbed Gecko assis, a classic 8B+ boulder in Rocher de Boligny, Fontainebleau. It's his second of the grade and, amazingly, Nathan reckons it wasn't even at his limit. 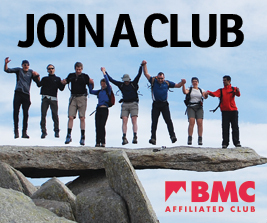 Here at the BMC we understand the importance of families, and we want BMC-affiliated clubs to be able to better support their members who have children and wish to include them in club activities, so that’s why we’ve introduced a new club package. New support programme for student club members. Get skilled up with an instructor from Plas y Brenin at a reduced rate! The premier climbing competition in Wales is back and it's heading to the Beacon Climbing Centre in Caernarfon! Open to both adult and youth climbers, competitors will rope up and take to the wall to compete for the title of best climber in Wales! New this year is the 45+ veteran category, find out how to sign up below. The BMC’s North West Area has a new team and is on the lookout for keen people with a range of skills to help create a vibrant feel to the local area. Climbers and wildlife both had a great year at Pembrokeshire in 2018. With some great ascents, a successful bird and seal breeding year and climbers sticking to the agreed restrictions, it was a "win-win" for all! Read on also for details of the 2019 Range West access briefings. 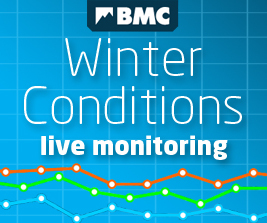 There's snow joke here: BMC Travel Insurance is serious about making sure our members are covered for any occurrence, which is why we provide £10 million emergency medical cover. And this winter, get 15% off all annual Alpine & Ski policies in Europe.